Yesterday I was directed to a blog callled La creation du jour, its french and has lots of fun ideas for cooking, sewing etc unfortunately it is full of translations of other peoples fabulous ideas, translated without permission from their rightful owners and was charging for the privilege. It has now been taken down but just in case you are in need of a lovely bag design, you can go visit the lovely U-handbag blog which has fab bags with free to download pdf’s here. Sewing here has been all boxbags and needle cases, bags will be up in the shop later today, I am hoping the sun comes out for a decent photo opportunity. 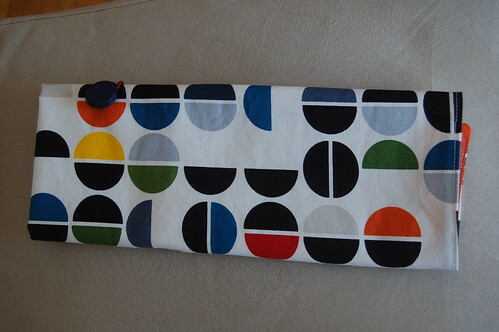 Pic of a case for 12 circular needles in some new fabric which I love. merci, c’est un site vraiment très intéressant.